We are committed to providing individualized attention to each of our client's needs, and also are committed to exceeding their expectations in our handling of their legal matters. Areas of Legal Expertise -Civil and Business Litigation -Real Estate Litigation -Personal Injury -Breach of Contract -Loan Modification -Foreclosure Avoidance -Neighbor Disputes Mr. Ripley has over 30 years experience in handling civil, business and real estate matters in Southern California. He works closely with clients to understand their goals and create a strategy to obtain a positive result for them. No legal matter is considered too difficult, nor is any matter treated as routine. Each case is analyzed on its own merits, from a fresh point of view. The approach to litigation taken by the Law Office of Michael Ripley is to strategize according to the client's needs. While the office has been successful at resolving cases early through either dispositive motions or through mediation, the firm also undertakes specific litigation strategies to accomplish the client's goals. Our Law Firm has extensive experience in a wide array of legal matters which include: Business, Civil, Insurance, Real Estate Litigation Loan Modification and Loss Mitigation Services Personal Injury and Serious Accident Cases Contract and Real Estate Disputes Our firm has experience in a multitude of litigation and business matters, including Contract, Real Estate, and Civil matters, in addition to its Loss Mitigation/Loan Modification department. We have represented personal injury clients, achieving multi-million dollar settlements and six-figure Jury verdicts in such cases, and have also provided personal injury defense for San Diego Transit and San Diego Trolley for over 20 years, in cases ranging from soft tissue type injuries to catastrophic injury cases. Also, Michael Ripley has maintained a Real Estate Broker's license for over 20 years. Our clients in this area have included Real Estate Brokers, Agents, Realty Firms, and Individuals. We have handled cases in matters such as Failure-to-Disclose and Breach-of-Fiduciary-Duties. 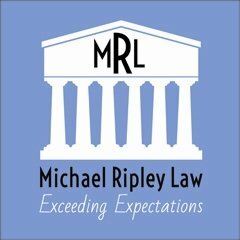 The Attorneys at the Law Office of Michael E. Ripley, understand that the law affects people in many different ways. This is why we are happy to count amongst our ranks some of the best Carlsbad attorneys specializing in various areas of the law. Each and every one of our skilled Carlsbad attorneys have experience in both counsel and representation, and many of them are certified in more than one area including Personal Injury, Civil Litigation and Contract Disputes. Here are only a few of the services that you can rely on Law Office of Michael E. Ripley to perform to your entire satisfaction. Legal Expertise If you require Carlsbad legal advice or representation, do not hesitate to call Law Office of Michael E. Ripley today. Someone is standing by to help you take your first step towards putting matters of the law behind you. While our specialties include: Personal Injury, Civil Litigation and Contract Disputes, we offer many other legal services: -Bicycle Accidents Involving Motor Vehicles -Construction Site Accidents -Dog Bites -Intersection Bicycle Accidents -Product Defects -Slip and Fall or Trip and Fall Accidents; Premises Liability -Truck Accidents Auto Accident Cases Data from the NHTSA indicates more than 22,000 people are killed, and approximately 2,000,000 are injured, in passenger automobile accidents every year in the United States. Of those accident victims, 10% become disabled. Quite often, accidents are caused by someone's negligence in rear ending another car, running a red light or a stop sign, failing to look in all directions before making a turn or entering a street, making an unsafe lane change, using a cell phone or texting while driving, or worst of all, using drugs or alcohol while operating an automobile. Bike Accident Cases Motor vehicles and bicycles are bound by the same laws. Bicyclists have the right to be on the same road as motorists. In many cases, these laws governing the road are simply rooted in common sense. Yet, despite these common sense laws and rules, drivers still ignorebicyclists' right to the road, injuring or even killing the bicyclist. Involving Motor Vehicles Cars, however, are not the only motor vehicles that injure bike riders in California. Trucks, SUVs, 18-wheelers, buses and other commercial vehicles all of them can cause a bike injury. Construction Site Accidents Construction sites usually involve many different kinds of trade working at the same time on a project. This can make a personal injury case resulting from a construction site accident more complex. It is important to investigate as soon as possible after an accident to determine if the general contractor, one or more subcontractors or the property owner should be held responsible for injuries. Dog Bites There are, according to USA Today (May, 2012), more than 78,000,000 dogs in the United States, one for every four persons. Although the vast majority of those dogs are good, safe pets, there are some that are dangerous. Unfortunately, there is unpredictability to whether a dog is safe or not. Children are particularly at risk of being attacked or bitten by a dog, in part because children do not appreciate warning signs and may not know when to back away. Also, dogs can be unsure as to how to interact with children, and can be provoked to attack or defend their space or toys. Collectively these factors account for more than 60% of dog bite cases as involving children as victims. Another contributing factor is that children are smaller than adults, and have a lesser ability to defend themselves. Intersection Bike Accidents If you or a loved one has been injured in a bike accident, you can rely on The Law Office of Michael E. Ripley. Located in San Diego, California, the firm focuses on bike injury cases in The Coast Cities of San Diego, Solana Beach, Encinitas, Del Mar, La Jolla, Oceanside, Carmel Valley, Leucadia, Carlsbad, Pacific Beach and Ocean Beach. The firm dedicates itself to ensuring that bicyclists' rights on the road are protected. The firm accepts cases in which bicyclists' rights are ignored by motorists cars or trucks or by any other roadway users, such as pedestrians and runners. Product Defects Many products used on a daily basis can potentially be defective and cause injury to adults or children who use them. If you or a loved one is injured by a defective product, the Law Office of Michael E. Ripley can file a claim on your behalf, and file a lawsuit thereafter, to protect your rights and seek compensation for you. Slip/Trip & Fall Accidents Property Owners, Landlords and Leasing Agents in California are responsible to make sure that their property is clean, habitable and without unsafe or hazardous conditions. When a property owner or property manager does not keep their property safe or free of hazardous conditions, or if they fail to warn people on their property of unsafe or dangerous conditions, they can be held liable for falls or other accidents that occur on their property. Michael E. Ripley was graduated from the UCLA School of Law in 1979. Before that he attended the University of California at Irvine, obtaining Bachelor's degrees in both Criminal Justice and in Psychology. He is "AV" rated by Martindale-Hubbell (a nationwide attorney rating service), its highest rating. Mr. Ripley has practiced law in Southern California for over 32 years. He spent the first 12 years working for law firms in San Diego and Orange County, focusing his practice on Civil, Real Estate and Business Litigation, Personal Injury, and Products Liability. For the most recent 20 years, Mr. Ripley has managed and operated his own law office, with his law practice focused on Loan Modification/Foreclosure Avoidance, and Litigation, including Business, Civil, Real Estate, and Personal Injury.